A massive fire in Canada has engulfed the CN Rail trestle bridge in the community of Mayerthorpe, Alberta. An investigation is underway as this is the 17th suspicious fire in the last six days. 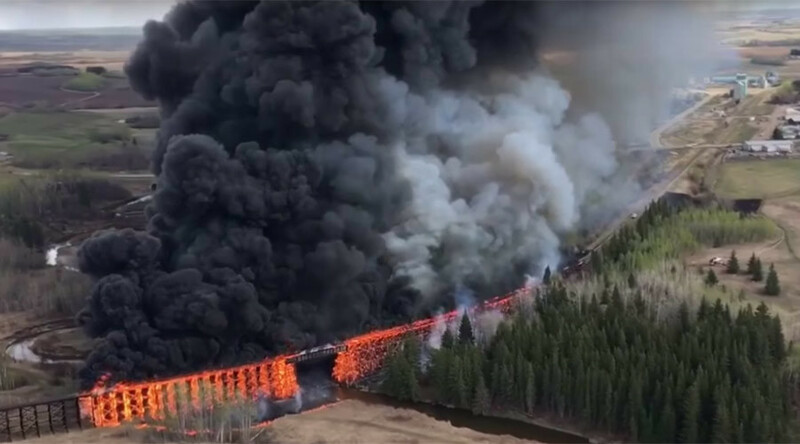 According to police, the fire, which destroyed the bridge some 120km northwest of Edmonton, southern Canada, could have been set deliberately. "It is suspicious in nature,” fire chief Randy Schroeder told CBC. "There were some witnesses that indicated people were in the area at the time of the fire." The area has seen no fewer than 17 fires in the last six days, and the police are now vigorously investigating each incident. The following video shows the wooden bridge being completely incinerated by the flames, with black smoke billowing up into the sky. Nearby businesses, schools and a trailer park with 38 homes were evacuated. He described the entire construction as having fallen down. The first of the firefighters and some rail workers arrived on Tuesday at 1:30pm local time to fight the flames. By 3 p.m., air support from Alberta Forestry was called in, according to the Edmonton Journal. A total of 24 wildfire firefighters, a helicopter and one air tanker group were used to contain the blaze. There were no injuries and people were able to just close their windows and vents to avoid breathing in hazardous fumes. Residents were told they could return home about 4:24 p.m., when the first fire was contained.